A collection of Eaux for him and for her, so that each can sense the constant presence of the other. An Eau with a clear freshness, an ode to simplicity. 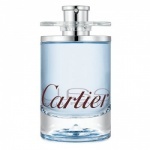 The rough and elegant vetiver roots' energy crystalizes the power of the Eau de Cartier. Vétiver Bleu combines both the mint freshness and the woody aromas' warmth. A vetiver with multiple facets, covering the skin of emotions with its smoky facets.